"The proper treatment of the original occupants of this land - the Indians - is one deserving of care and study. I will favour any course towards them which tends to their civilization, Christianization and ultimate citizenship". "What we can and should do is.....to fit the Indians, as much as possible, for the habits and occupations of civilized life, by work and education; to individualize them in possession and appreciation of property, by allotting to them lands in severalty, giving them .....title individually to the parcels of land they cultivate"
"Like other mistaken policies it was all part of the centuries old aim of turning Indians into white people". During the 1870s the protestant churches lost control of the Indian agencies, but they still retained control of government policy towards the native Americans. In 1881 Helen Hunt Jackson produced a damning critique of American Policy towards the Indians which was called " A Century of Dishonor". Although Jackson herself offered no immediate solutions, the detail in her work inspired the Reform movement, whose people saw themselves as champions of the native Americans. However in practice the direction they took policy was not to the liking or in the interest of the native Americans themselves. Liberals like Schurtz, Secretary of the Interior 1877-1881, saw the Indians as 'standing in the way of the development of the country, (they would) form part of it and (benefit) by it.' At best it was patronising, at worst it was arrogant and gave new opportunities for the land grabbers to get their hands on lands which had been promised to native Americans. 'as long as the grass shall grow'. In the words of the reformer Richard Henry Pratt in 1878,: 'the Indians...remained.....in the enjoyment of their savage life....he is in childish ignorance of the methods and course best to pursue'. Pratt's answer was to 'give the help that he now needs'. (1) Previous 'friends' of the native Americans had seen the reservation system as the key to solving the Indian 'problem'. Now the reservation system was seen as its cause. Although reformers like Pratt did not see native Americans as racially inferior their perception of the inferiority of Indian culture amounted to the same thing, since their culture was part of the native Americans' essence. The Reform Policy was designed to 'civilise' native Americans by suppressing their communities and culture, and fragmenting their cohesion, thereby integrating them into the American racial melting pot. Richard White identifies three ways in which this was done (2). 1. Traditional customs and practices - in the family or community - were to be discouraged, or if that did not work they would be banned. 2. Children would be 'educated' -in practice indoctrinated - with the Protestant white American values instead of their traditional values. 3. The common ownership of land was to be changed - reservations would be broken up into 'allotments' for families to cultivate. The basic premise behind the new policy was that traditional native American culture had no value. If they failed to understand this they would be forced to accept the superior culture of the Whites, and to be integrated into American society as individuals, instead of continuing to retain their separate cultural identity. This became known as 'assimilation'. Most of the native Americans had been subdued by the military and now relied upon government aid. This gave the reformers the power to enforce their policy by rewarding 'good Indians' who complied with their demands. However if individuals ignored the new laws which banned traditional ways, they were put in prison. In 1883 'medicine making', bride payments and polygamy were made illegal. In 1884 so was the Lakota Sun Dance. Practicing their cultural heritage was seen as "anti progressive", a "hindrance to civilization of a tribe" and left them open to the charge of committing an 'Indian Offense', with varying punishments starting at ten days in the Indian Agency guardhouse. 2. 'kill the Indian and save the man'. Following the Red River War, in the southern plains, some Cheyenne, Kiowa and Comanche prisoners, many arbitrarily selected, had been exiled in Fort Marion Florida. Richard Henry Pratt, a serving army officer, supervised them from 1875-8. (4) He reached the conclusion that education was of paramount importance in 'civilising' the Indians. Pratt obtained funding from the government to help him to open a boarding school for Indian children in Carlisle, Pennsylvania in 1879. He famously summed up his idea as 'kill the Indian and save the man'. Although he perhaps overstated the case because he felt under threat, his was the ultimate in cultural arrogance. The aim was the destruction of a separate cultural identity in order for the individuals to be assimilated into the superior culture of the white Americans. To do this it was necessary to take them away from the "degradation" of their families. Children were forbidden from speaking their own language, practising their own ways or contacting their families. In keeping with Pratt's background the schools were run on military lines, with obedience demanded; formal timetables and approaches including marching drills were adopted. Discipline was strictly enforced to support the inhuman environment. Native beliefs were replaced by Christianity. While half the time was devoted to 'education', half was given over to 'industrial training'. To further "encourage" cultural assimilation the practice of "outing" was commonly adopted whereby after a lengthy introductory period the boys and girls were allocated to local white families. Once at the school, the transforming or "civilizing" process took place. The new clothing felt "cumbersome and awkward", "our hair was cut", new names like "John, Henry or Maggie" imposed, and a totally different diet introduced. "the change in clothing, housing, food and confinement, together with lonesomeness was too much and in three years nearly one half of the children from the Plains were dead and through with all earthly schools." (7) The harsh, military style of life was enforced by an often harsh disciplinary approach. And what became of the children who made it through this system, did their experience benefit them? 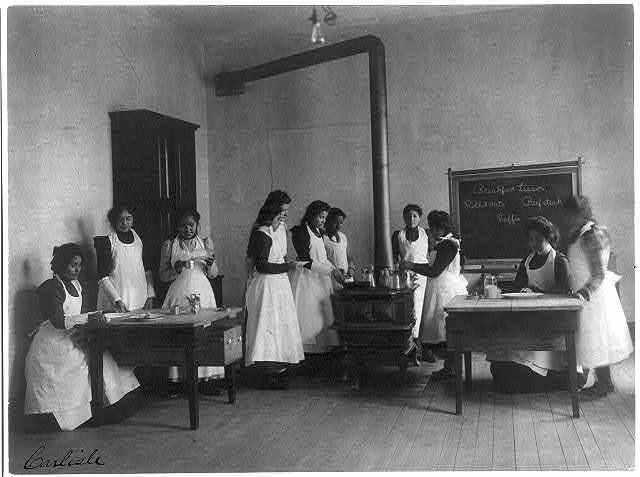 "had it not been the employment of former students by the paternalistic Indian service (agencies and schools) few would have found any use for their training.....on the whole Indian girls did not assimilate into American society....women were trained for an imaginary situation....placing them in a foreign, structured atmosphere accomplished more confusion and hostility than acculturation." (8). Mercifully the schools were costly, and the boarding schools themselves had a fairly short life. However they were moved closer to home where they became local day schools, and these type of schools persisted into the twentieth century. Senator Henry Dawes observed that what the Indians needed was 'selfishness, which is at the bottom of civilization. Till these people will consent to give up their lands, and divide them among their citizens so that each can own the land he cultivates, they will not make much more progress.' (10) Cultivation of the land had been a central theme of the myth of the west, begun by Thomas Jefferson who saw individual farmers as the keystone of democracy. Its suitability for native Americans was not questioned; it was a self evident fact. Tribal land would be 'allotted in severalty' - it would be split up into small family units. It was claimed that the interspersing of white families among those native American ones was desirable, as this would encourage them to grow crops and become self sufficient independent farmers. But in practice this meant profits for the land grabbers who may be seen as a major force behind the reformers' ideas gaining wider acceptance. The Allotment Act which was passed in 1887 became known as the Dawes Act after its instigator. To begin with the Five 'Civilized' Tribes and the Sac, Fox, Sioux and Seneca Nations were allowed to carry on as before, but eventually their lands were also 'redistributed' in the 1890s. Between 1881 and 1900 about half the native Americans' land was taken from them. (13) Astonishingly this policy claimed to be rectifying the wrongs inflicted on native Americans previously, but all that happened was for the injustice to be compounded. The Dawes Act and its subsequent revisions robbed Native Americans of their newfound homes in Indian Territory. It encouraged white settlement and a land rush followed. They became known as 'sooners' since commonly they 'jumped the gun' and set off to stake their claim before they legally should have.